And then I read the paper, and the fun ended. Here is a selectively informed, biased observer coming up with preordained conclusions. Shorter (and clearer) Max Manwaring: Venezuelan President Hugo Chávez is actively exporting the ideology and practice of asymetrical warfare to a wide range of criminal, terrorist and anti-US organizations and governments as part of an unreformed Leninist revolutionary ideology. This entry was posted in Uncategorized on December 26, 2012 by Steven Bodzin. Chevron in Argentina: Hoping for a breakdown in division of powers? The Ecuador plaintiffs seeking $19 billion from Chevron Corp. just sent out an interesting little press release, pointing out this article in La Nación in Argentina. I think it’s worth noting. Why? Because most of the pro-corporate types who watch South America point to the breakdown in division of powers between courts and executive as being a bad thing. And here, La Nación says that a big corporation –Chevron– will only move ahead with its new oil plans if judges rule a particular way on a court case. That could set up an interesting situation regarding division of powers, as the executive branch wants Chevron’s investment and so it has an interest in vacating a big judgment in favor of Ecuadorian rain forest residents. Here’s the link, and here’s a bit of a translation. This entry was posted in Uncategorized on December 22, 2012 by Steven Bodzin. I don’t think this is really about defamation, as nobody has yet told me how anything I have said was defamatory. Instead, they just seem very keen on avoiding press attention. Personally, I find this all pretty funny, as their efforts have been mostly self-defeating. At first I didn’t care much about this Derwick case. But these guys couldn’t just sit there and let the skeptical reporting go. They had to attack. And now, they are looking ever more interesting. This entry was posted in Uncategorized and tagged derwick, lawsuits, venezuela on December 21, 2012 by Steven Bodzin. As I said the other day, I contacted Pacific Rubiales for comment on this story and the company sent me a response Sunday. I am just posting it as I was out in the mountains, away from even telephone contact. With no edits at all, here is what the company sent me. Always best to hear all sides in a situation where some people are being killed and others are being accused. 1. Milton Enrique Vivas was a worker in the Cara-Cara Field, which is at least 170km away from PRE’s operations. 2. Cara-Cara is an concession contract for oil and gas production called “Contrato de Asociación” by and between the Spanish Company CEPSA and Ecopetrol. 3. Pacific Rubiales has no participation in this operation. 4. Mr. Vivas was not actively pursuing any union related agenda with pacific Rubiales. Regarding our official stance and our comment, we would like to state that Pacific has been respectful of the union activities undertaken by the USO with direct and indirect employees at the Fields, particularly when you consider that Pacific has allowed the USO to execute several activities in the Fields, for the promotion and understanding of the freedom of association in the Oil & Gas Sector regardless of the fact that they do not represent any of the Company’s employees at the Field. Any and all allegations stated by the USO regarding discharges, dismissals, excessive work hours and days, precarious housing conditions, and violation to the right of association are not only misleading towards the general public, but we also categorically deny; we would nonetheless be pleased to review any actual support. Regarding CGC and MRS, we would be happy to forward your observations to the specific Company, considering that these are outside the scope of our Management Team. Also, Boz checks in to remind me that Colombia is no longer the deadliest place in the world to be a unionist, as Venezuela took over the top spot. And, I am amazed that my report about a Colombian unionist getting killed got a tenth the page views of my off-the-cuff ramblings about possible directions of the Venezuelan oil industry post-Chávez.The Colombia story is more important and includes original reporting that required a trip to a remote part of the world where almost no English language reporters have gone. But I guess I’ve learned an important lesson. You want hits? Make provocative and un-disprovable statements about Venezuela. This entry was posted in Uncategorized on December 18, 2012 by Steven Bodzin. Published today in El Nacional, a newspaper in Caracas. If there’s interest I’ll translate this, but don’t have time at this very second. Derwick can’t be bothered to send a letter here, despite my permanent policy of providing a forum for those who take exception to my reporting and my specific request to their lawyers that they write me if they have an issue with anything I’ve said. Instead, they took out the ad, text pasted below, in which call me and others “agents” in a “campaign of defamation.” If I’m someone’s agent, I wish they’d tell me where to pick up my check. By the way, Derwick’s reputation self-due-diligence company, FTI Consulting, had someone searching for online info about me the other day. No big deal, but I find it odd how so many “investigators” snoop around in obvious, self-revealing ways but never bother to pick up the phone and just ask questions. Reminds me of this. Anyway, I thought this statement from Derwick deserved to be archived publicly. So here you go. If Venezuela government changes, what happens to the oil industry? This entry was posted in Uncategorized on December 14, 2012 by Steven Bodzin. 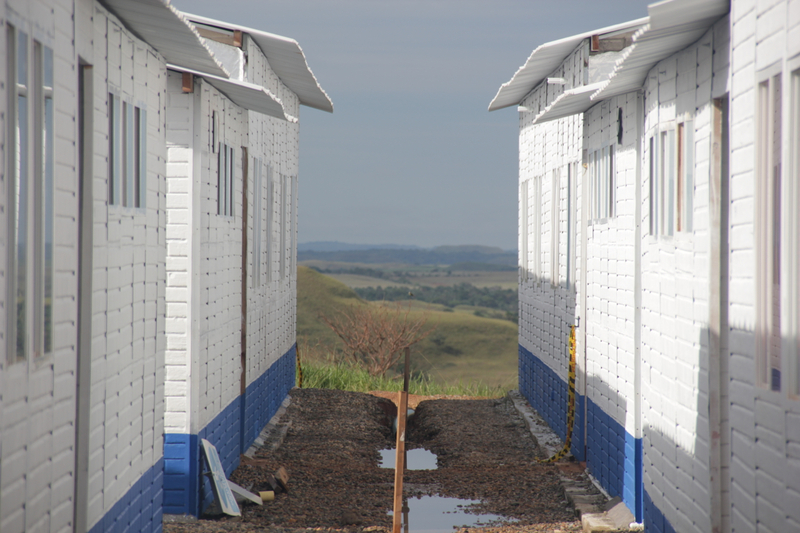 Llanos of Colombia’s Meta Department seen from Termotecnica worker housing occupied by strikers, August 2012. Milton Enrique Vivas, 42 was killed 11 December. He was a union activist who had taken part in fights for better conditions at different companies.